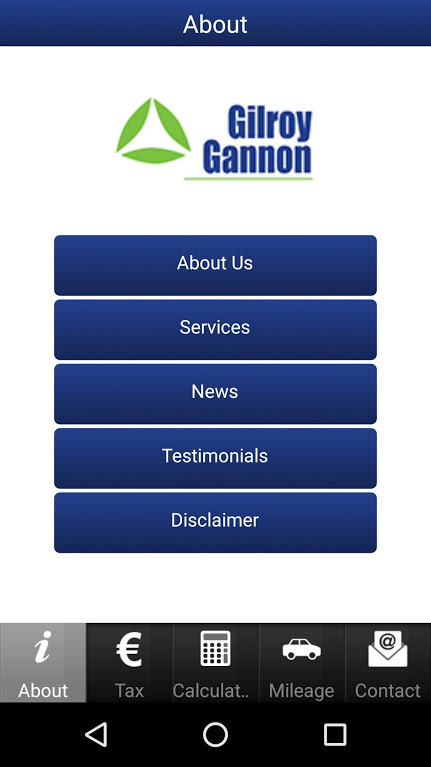 Gilroy Gannon Chartered Accountants are delighted to announce the launch of our free brand-new mobile App. The great news is that this App can be downloaded free onto your iPhone, iPad or Android devices. It’s packed full of some really useful tax tables, calculators and important financial dates, all of which you will be able to access for free, anywhere you have an internet connection on your device. What will the Gilroy Gannon App do for you? The App has been carefully designed in response to the growing use of smart phones and mobile devices used by our clients. We wanted to develop a way to keep you up to date with the very latest news and tips from Gilroy Gannon as well as providing you with key accounting data, in real time, at your fingertips. The Gilroy Gannon App will enable you to calculate the tax on certain company cars or check the amount of tax you might be paying. It will give you the power to check Stamp Duty costs or see how you might increase your profits as a business. This App was designed to provide every service you could ask from us. We’ve put invaluable tools and features such as calculators, tax tables, logbooks, receipt and income management together with instant access to the latest financial news and information and valuable company info, directly from us. With all this on one App, it’s likely be your go-to tool in the future.